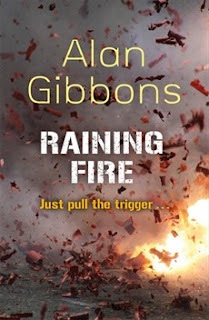 Raining Fire by Alan Gibbons was a fantastic book. I read it in a matter of hours as it was extremely fastpaced, well-researched and featured a cast of realistic characters. The story centres around Ethan and Alex, two brothers who live on an estate run by a gang called The Tribe. Relations between The Tribe and the neighbouring gang called the North Side Crew are tense at best. As Alex is pulled into the conflict, Ethan must decide just what he will sacrifice in order to protect his brother and how far he is willing to go to protect those that he loves. This is the first book that I read by Alan Gibbons. He is a brilliant writer as he quickly immersed me in Ethan and Alex’s world. The pages are full of action. Though the story takes place over two years, so much happened that before I knew it, I was finished. Gibbons perfectly captured the essence of gang life, culture and warfare that many of us know about but have never had direct contact with. Our main character Ethan knows gang members and is even friendly with them, but he has higher aspirations than to be in a gang. He wants to be a footballer, and luckily for him, he has the skills to go along with the dream. Ethan was a great main character. Though he has his own dreams, he is always looking out for his loved ones. It’s because he cares that he has to enter a world he would much rather avoid. Gibbons shows that it is all too easy to become a part of a gang. For many, they feel as though they have no other option. However, I’m not going to excuse crimes committed by gangs and Gibbons doesn’t either. He shows that gangs are downward spirals that lead to destruction as they live by a motto akin to ‘an eye for an eye.’ I felt for Ethan and hoped he could leave the vicious cycle. Overall, I would recommend Raining Fire to teenagers. It’s highly relevant to our society. I look forward to reading more from Alan Gibbons. Very glad you liked it! Thanks for the great review, Kulsuma!